Peter Schmeichel has called for David de Gea to commit his long-term future to Manchester United after boss Louis van Gaal confirmed he won't be sold in this transfer window. The Spanish goalkeeper has been linked with a move to Real Madrid for most of the summer and has been left out of United's first five games of the season. Sergio Romero has played instead, with Van Gaal saying he dropped De Gea because he could not focus as a result of rumours linking him with a switch to the Bernabeu. Former Old Trafford goalkeeper Schmeichel has been critical of the fact the saga has been allowed to rumble on to the last few days of the summer transfer period. "I want the situation to be resolved. I think it's an absolute joke that it's carried on into the season." With Van Gaal believing he will hang on to De Gea, the Dane who played in United's 1999 Champions League win over Bayern Munich now wants the 24-year-old to stay for the long run. Schmeichel told Sky Sports News HQ: "I hope that we'll see him. I hope that some kind of resolution is found within the next couple of days. 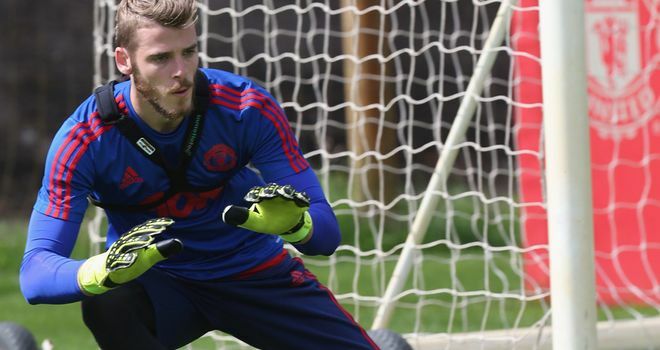 "I would love David de Gea to commit to Manchester United, you know, and sign a new five-year contract. He has been absolutely outstanding in the last two seasons. "But I also understand when Real Madrid - who are from his home town - when they come calling, of course you want to go back there. "I think everyone would think like that so I've got great understanding. I'm very, very thankful for what he's done for Manchester United and I would hold nothing against him if he moves on. "But I want the situation to be resolved. I think it's an absolute joke that it's carried on into the season."